If you missed this spectacular study first time around, grab it now. 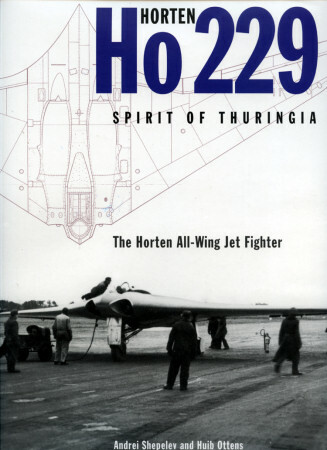 Classic – an imprint of Ian Allan Publishing – has reissued Horten Ho 229 Spirit of Thuringia: The Horten All-Wing Jet Fighter. And it not only chronicles this futuristic fighter, but all other cutting edge flying wings from Germany's pioneering Horten brothers – Reimar and Walter. After illuminating introductory notes, coverage recaps initial Horton Nürflugel ("wing only") designs. Text next turns to early World War II activities – and thence to three chapters on dedicated warplane studies, chiefly H IX derivatives. All proved abortive. And Nazi Germany's collapse – summary sections reveal – largely marginalized both brothers. After futile efforts to recruit Western partners, for instance, Reimar eventually resumed his work in Argentina. Walter, by contrast, "made a significant contribution to the creation of the post-war German Bundesluftwaffe". Classic's informative epilogue ably assesses their true mark on aerospace history. Don't skip it. Hundreds of photos and scale drawings spice Shepelev's and Otten's story. Sidebars and extended captions further enrich the account. Late-war Luftwaffe enthusiasts will really love this terrific tome.